The first nursery at Kirstenbosch was established in 1913 below the Dell, next to the bath stream. It consisted of ten small terraces, each 15 m long by 2 m wide, and a wooden potting shed. 16 More terraces were added in 1914. It was used for several years but was extremely cramped and inconvenient. The current nursery on the eastern side of Rhodes Drive was laid out and the buildings constructed by garden staff and labourers in 1923-25. The ‘new’ nursery consisted of an office for the Curator, a potting shed, propagating glasshouse, succulent house and potting shed, store, tool rooms, packing rooms, frames and a drying shed. These buildings were in use until 1995, when they were demolished to make way for the Botanical Society Conservatory and Visitors’ Centre. The Garden Office, Stores and Seedroom were relocated to their current site in 1995-96 and the remaining terraces and glasshouses were given a complete makeover and replaced with state-of-the-art glasshouses in 2000 – 2001. The nursery makeover was funded by the Kirstenbosch Branch of the Botanical Society of South Africa. A second nursery was established on the north eastern edge of the Garden in 1985 to deal with the volume of plants required for the Garden and to make more plant material available to the nursery trade. This ‘new’ nursery was focused on production, and is known as the Production Nursery, while the ‘old’ nursery, now known as the Collections Nursery is focused on housing the living plant collections of Kirstenbosch: the cycads, pelargoniums, ericas, Lithops, Gasteria, Crassula, bulbs, ferns and many more. Kirstenbosch horticulturists collect plant material from the wild, propagate and grow them in the nursery and Garden. Careful records are kept for all plant collections, and the movement of all plants in the nursery and garden is tracked by Plant Recording. Rare and threatened species, as well as plants with horticultural potential are targeted. 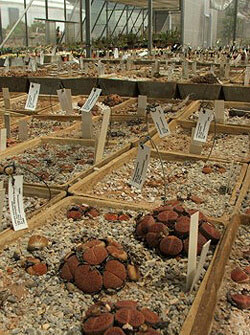 There are roughly 25 000 accessions and 6 800 species in cultivation at Kirstenbosch.